If you're going to be doing any development with Alfresco, you'll find that at the heart of much of the development are Web Scripts. Alfresco calls their Web Script technology "agile script-driven MVC". Web Scripts enable very quick web application development. Instead of a single monolithic system, Web Scripts use a very focused light-weight approach for building components that can be combined and reused. Alfresco Webinar on Web Scripts. A high-level overview. 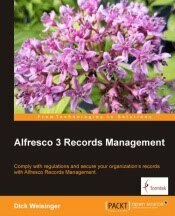 Alfresco Web Scripts -- PDF Document by Alfresco/LifeRay. A bit light on specifics, but great graphics. Alfresco Web Scripts Wiki page. A good place to get started. Web Script Examples Alfresco Wiki page. Large number and variety of cookbook examples. Alfresco Developer Guide by Jeff Potts. Chapter 6, 'Exposing Content through RESTful APIs with Web Scripts'. Great resource. A similar version of this chapter is available here. Best Practices and DRY. Break up Web Script files and use 'import' and configuration files. Using 'Remote' in Web Scripts. Lets Alfresco Share Web Scripts call into Alfresco repository and external services.